This is quite a nice Economy Standard with key ring, or Spartan without toothpick and tweezers. 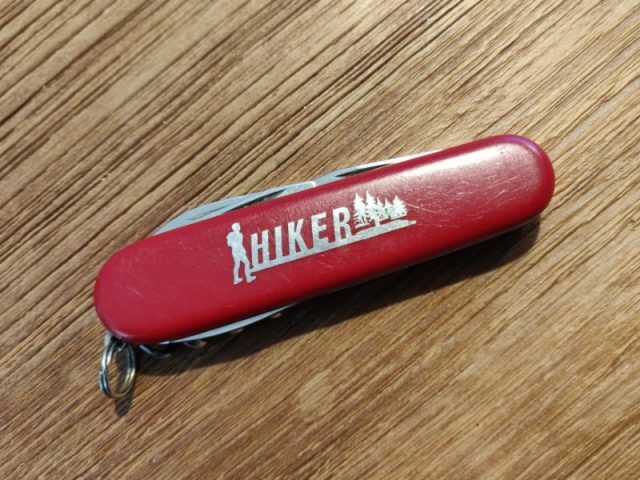 It has a metal inlay with the word HIKER, some hiker dude and a couple of trees. These were made for the Canadian distributor SMICO, along with an ALPINEER (actually a Passenger) and a SCOUTER (actually a Recruit). You can fine some nice pictures by Karl over at SAKWiki. Rather confusingly, these were sold as Hikers, although the Hiker is actually a different model. 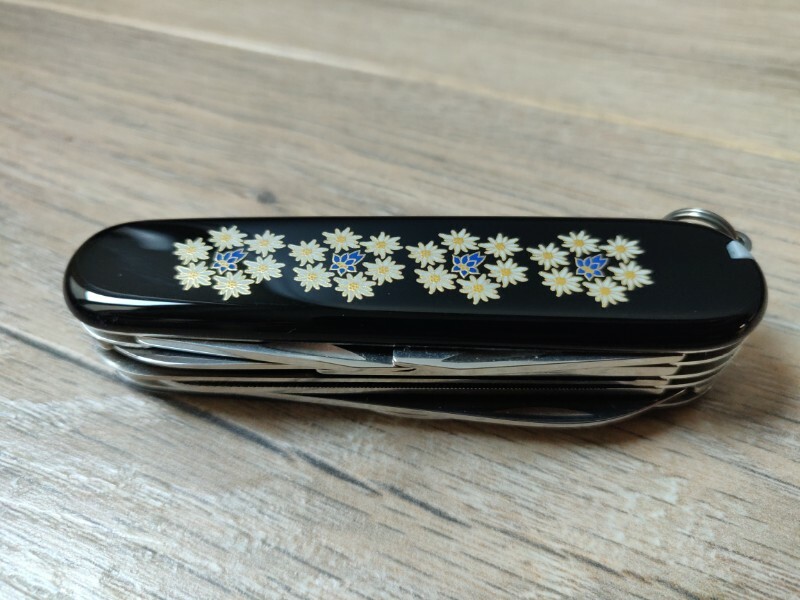 In the 1960s or 1970s Victorinox offered two versions of the Fisherman’s knife or Fischermesser. They were available with blue scales (uncommon back in the day) with a fish emblem on the top of the front scale, instead of the Swiss shield and cross. 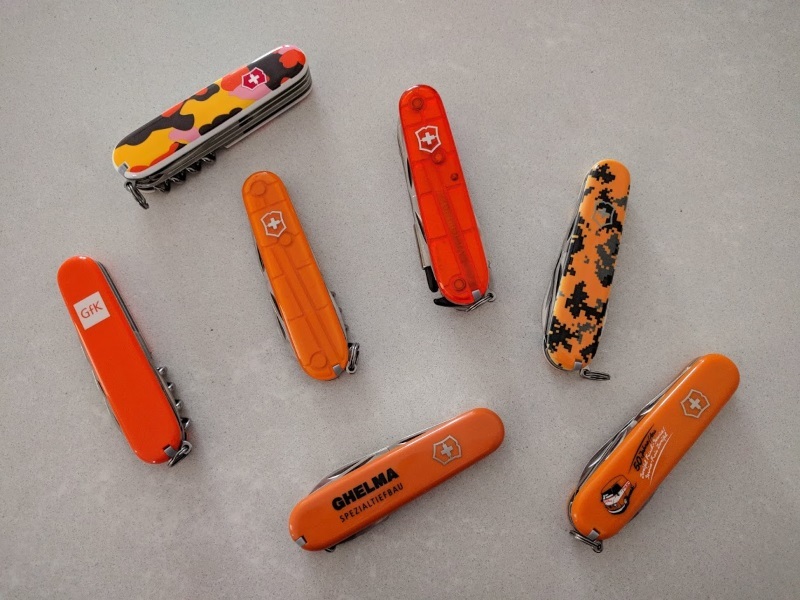 These knives were equipped with unusual scissors with a cut-out, and of course the fish scaler. The one I own is actually a bit more uncommon. It lacks scissors and a metal file. I have never been able to find a reference to it in any of the old catalogues. If I follow the old naming convention then this knife would have been a 234faU (Spartan or Standard with fish scaler, tweezers & toothpick and bail). 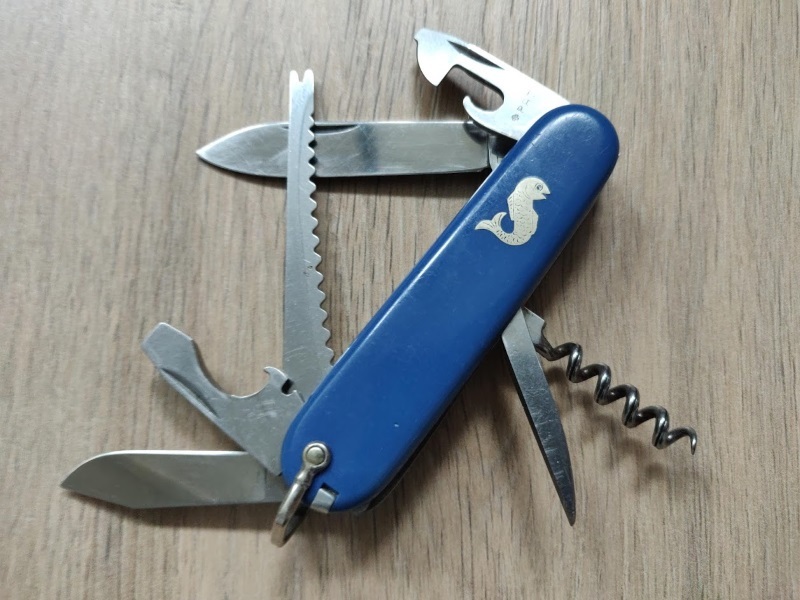 It has all the nice features of a vintage knife: thick main blade with Victoria tang stamp, +PAT stamp on the can opener, aluminium tipped tweezers, clip point small blade, five-turn corkscrew, bail/shackle and fish scaler without ruler. The scales are a lighter shade of blue than more recent cellidor scales. This unusual tool config minus the tweezers and the bail (or key-ring) was also used for the Battle of Murten Battle Series knife in 1989. I’m Dutch and I like orange SAKs. The CamoFun and Digital Camo ones are in fact white while the other five are actual orange SAKs in five distinct shades/colors. Most of these are quite rare. This is a limited edition Victorinox Huntsman Lite. It is numbered nnnn/1111 and was produced in 2006. 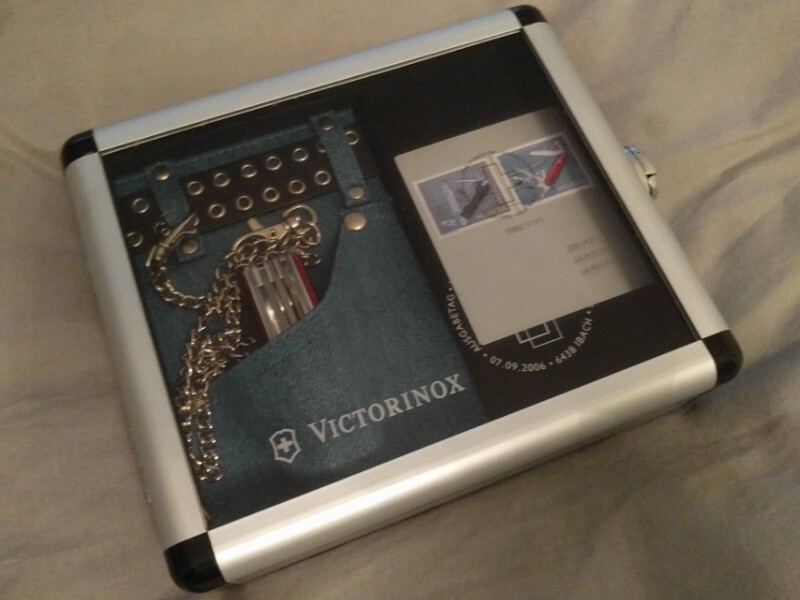 The alumin(i)um presentation case also contains a piece of jeans material with a leather belt and a knife chain, and two Swiss postage stamps. There is more info on SAKWiki. One of these had been on my wish list for quite some time when a while back I found one for a good price. And it turned out the seller lived in my own home town. Here’s a nice black Ranger with an Edelweiss print on the front scale. The Ranger is a five layer SAK with backside tools on each layer.